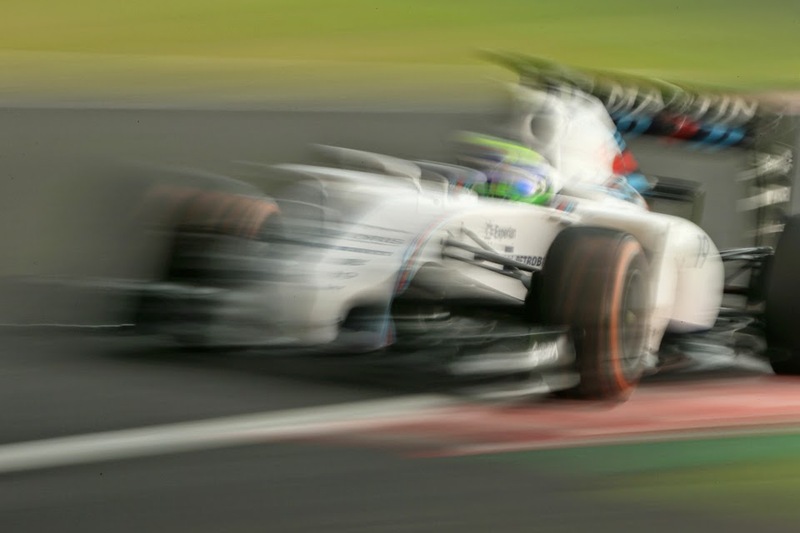 Talking about F1: The F1 blog: Interlagos Qualifying: Fightback or more of the same? Interlagos Qualifying: Fightback or more of the same? I suppose it shows the importance of getting the whole picture. Understanding the context. On the face of it the Brazilian Grand Prix weekend thus far could hardly have gone better for Nico Rosberg. He's topped every single session. And come qualifying having again headed the times in Q1 and Q2 he also topped matters in the important part to take pole. In an exciting session he pipped his team mate and title rival Lewis Hamilton, the latter apparently being pressured into a crucial error. For what it's worth too it now means that Nico has claimed the sport's inaugural 'pole trophy', for prevailing most on a Saturday in a season. But there was little abandon about the place. Everyone knew what the bigger consideration was. 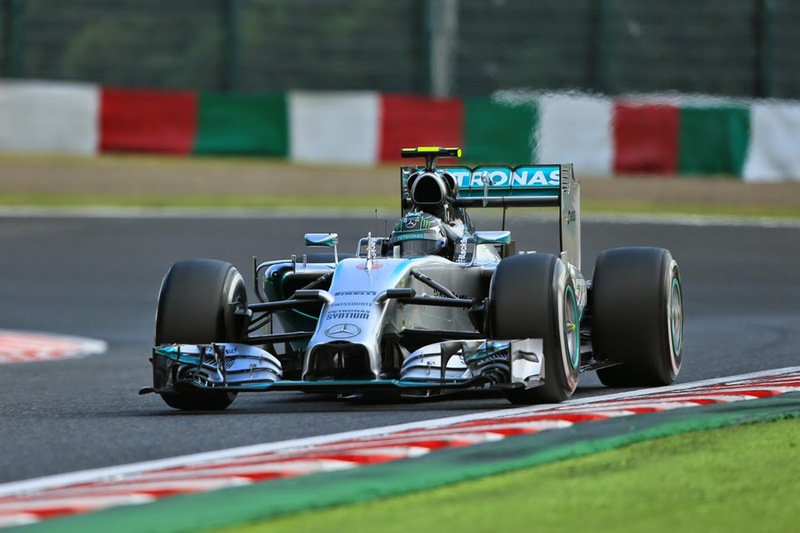 That of Nico Rosberg's nine pole positions won in 2014 prior to today he has only converted two to victory. That Lewis overturning his team mate's qualifying advantage in the race has been lately like an F1 equivalent of Groundhog Day - Bahrain, Monza, Suzuka, Austin. The names roll off the tongue. Will Nico prevailing today prove to be an in-the-nick-of-time start of a fight back or simply more of the same? This will matter. A lot. And it was on everybody's minds afterwards. This included Nico's judging by his words in the aftermath. Today he said was a 'perfect job only if it works out tomorrow. 'Of course I need to make it work out in the race, unlike Austin for example'. The words landed heavy. He presumably is as conscious of the previous as anyone. Lewis, possibly himself reflecting the flip side of these considerations, seemed calm despite missing out on the prime spot on the grid. 'It was great fun' he said, 'Nico did a great lap and I lost a little bit of time in turn 10 and perhaps a tiny bit in turn 1. Will Lewis Hamilton prevail when it matters again? Lewis seemed conscious too that tomorrow is a rather distinct consideration. As intimated Nico's looked the quicker all weekend, but when the vital for the grid Q3 arrived today the intensity cranked up fully. On the first runs Hamilton set a 1m 10.195 - much better than anything he'd set before, but Nico came around and pipped it with a 1m 10.166. And then on the second runs the same thing happened but on a slightly higher level. 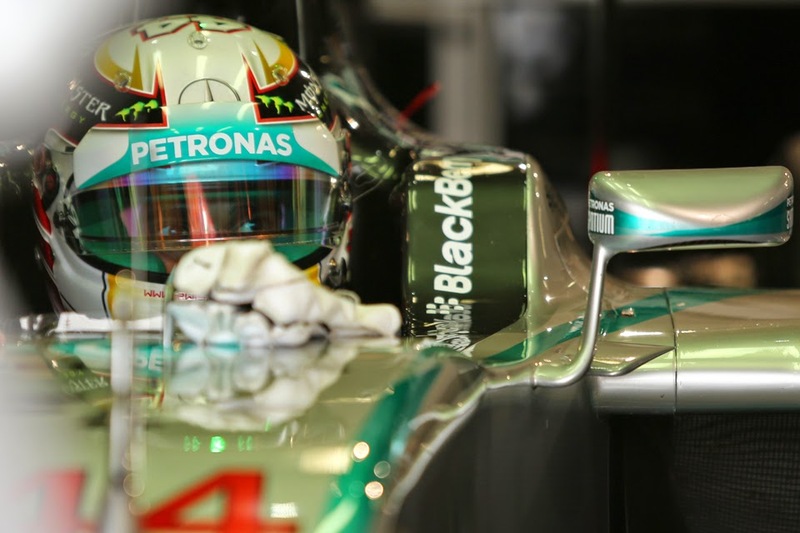 Lewis sat on provisional pole briefly with a 1m 10.056. Nico again sneaked under it by around three hundredths with a 1m 10.023. As mentioned a lock-up and slight rally-style back-in to Bico de Pato looked crucial. Further showing the importance of getting the full picture, whatever the headline appearances this wasn't the usual Mercedes walkover. The Williams, as you might imagine, were especially content to gobble up Interlagos's long uphill blasts, and it looked for a time that - while Merc remained the favourite - at least one FW36 getting onto the front row was possible. While Felipe Massa as has been seen repeatedly at this his home track appeared like he'd found an awful lot of extra urge. In the event neither Williams driver broke up the silver 1-2 and their final runs were compromised and aborted. Massa was released late due to a technical problem which resulted in his being dropped into traffic, while Valtteri Bottas pushing too hard ran wide. Rob Smedley's frustrated interview right afterwards, speaking repeatedly of 'missed opportunities', betrayed a lot. The rest indeed were way back, and some six tenths after Bottas in fourth we had the remainder of the top ten whose best times in the end were separated by just over a tenth and a half. McLaren though appeared to be continuing its better than before form and looked best of the rest, reflected in Jenson Button claiming P5. Sebastian Vettel sneaking into P6 seemed about the only one of this group better than par however. As for tomorrow the main story may well be whether Nico can challenge at last the concept that recently has started to crystallise; that he may lose something relative to his title rival when there are other cars around. He insisted afterwards nevertheless that he has learned Austin's lessons: 'I know what I need to do better, so from that point of view good to go tomorrow' he outlined. But there will likely be much more even than that to think about, and for Nico and everyone else. Tyres for one, as with Pirelli's Massa-inspired marginal selection the longevity of the soft tyre that everyone in the top 10 starts on will dictate whether you'll need to stop twice or three times. Niki Lauda spoke later of both Merc pilots needing to be in tyre conservation mode from lap one, while Nico described the degradation experienced as 'massive'. That's assuming a dry race. And there has been rain promised for just about all of the weekend but not yet arrived (when the cars are circulating at any stretch). It could yet be that tomorrow is the day that it makes itself felt. But Nico know that whatever happens he has to face and somehow beat a formidable - and familiar - foe. For Lewis Hamilton second place here and in the calendar-closing Abu Dhabi is enough to prevail overall. But such is Lewis Hamilton's way - and his form - you can guarantee he won't cruise in having settled for runner-up. He indeed has iterated repeatedly that his approach to racing has not changed this weekend, whatever the title mathematics. It's not clear what for Nico the answer is, but he has to find one. I believe, the outcome of this battle depends on tyres. If the degradation will be high, Rosberg most certainly can win the race. His driving style is more smooth and he is a better racer in terms of preserving tyres. On the other hand, if the tyres will be OK, it will bring Hamilton on the top. In these conditions Lewis can race almost in a qualifying pace lap after lap - his intensity is immense. Very much similar like Michael Schumacher at his prime. Yes, I agree if it's dry tyre management will be a big factor, especially in stint one. I've heard it rained overnight too so the track will be green, which won't help. So it may as you say be an avenue for Nico to exploit. But then again I'm not too convinced these days that Lewis is as bad at tyre management as some assume.